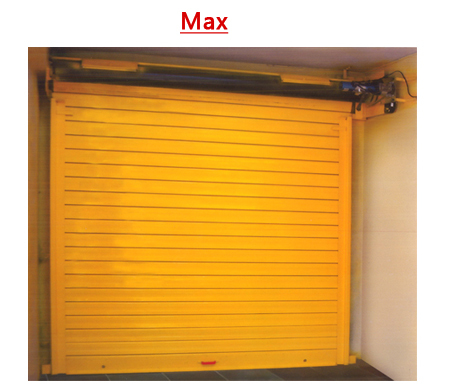 Vinayaga the name always comes ahead of others in the shutter industry now introducing MAX the Premier Shutter - for maximum strenght & durability. This is totally different from others Shutters combining 2 sheets to make it one for extra saftey. Double lath section in 0.6 mm thick for longer life and both ends locked with Nylon clips. Designed with 25 mm x 6 mm thickness flat at both ends for locking with guide. Available in Galvanised and prepainted sheets. Flat surface for easy maintenance. Rolling and flattening the shutter is much easier. Hallow in between the sheets give space for air to make it solid for double strength. Due to the fixed locking plate, the curtain will not come out from the given channel. Can withstand upto a wind speed od about 80 kmph. Ideal for Godowns, Factories, Warehouse and open space covering. Available in sizes to suit your requirement. Can be used for weather proof with buff in between the lath section.